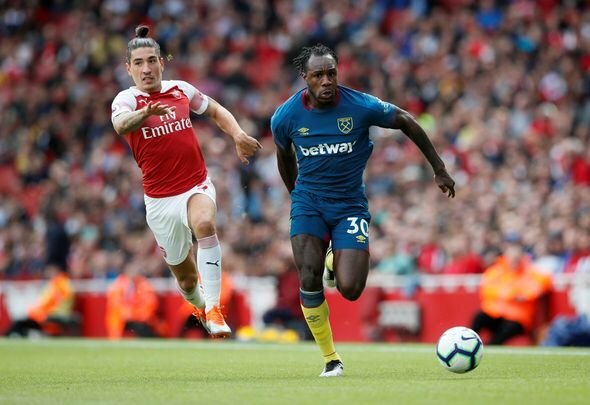 A number of West Ham United supporters have been reacting with scorn following Michail Antonio’s comments about wanting to rediscover his earlier form at the club. Given the player’s current inconsistent form, Hammers fans have understandably reacted poorly to his comments, many of them actually advocating his departure. need to start running then…..
It’s quite surprising to see the West Ham fans turn on their own player like this just because he said he wanted to rediscover his old form. Isn’t that what he should be saying? Obviously they’re frustrated with current results but Antonio isn’t solely to blame and he’s looking to get back to his best. Clearly the timing could have been better for these comments to come out – losing four in a row in the Premier League will do that – but he’s not saying anything wrong here. Surely it’s a good thing for West Ham if he can rediscover the form of his second season at the club, that could only help the team improve results. This is probably just a result of the fans’ anger at the team’s terrible start. Antonio hasn’t been good, but he’s certainly not been one of the worst offenders either, and Hammers supporters should be encouraging his quest to get better not ridiculing it.